Long long time ago, I used to play a cricket game on my computer. It was a DOS game and was called Allan Border's Cricket. Most of these cricket games were heavily tilted towards batsmen. 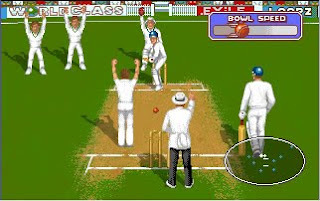 There were limited options with the ball, and most of the time any player, like a typical indian, would simply put the game on auto-player mode while bowling and then play when it came to batting. But I used to try bowling a lot (mainly because I was a better bowler as a kid than a batsmen). I saw that whatever I tried, it was really difficult to take wickets. Then I noticed that these computer players would always leave the bouncers alone (it was the era of test cricket). So I would drop most balls short. Then I tried reducing the pace. I reduced and ... what I see ... the batsmen got BOWLED by the slow short pitch delivery (hehehahaha). To some it might be discovering a bug in the game. To others it is innovation, out-thinking the computer (is that an oxymoron) and its physics laws by bowling out the batsmen with a slow bouncer. I invented the slow bouncer.